If “an apple pie without the cheese is like a kiss without the squeeze”, which is something old ladies say, then our newest recipe just got us to second base. Not with the old ladies. 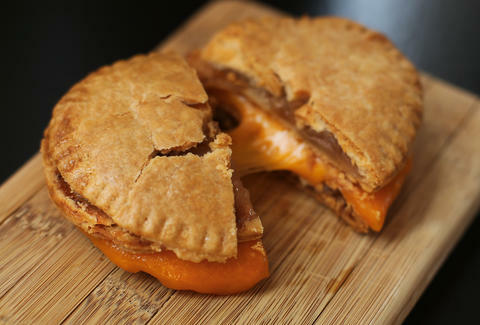 Sharp cheddar cheese and tart apple pie have long flirted with one another, but never has the sweet-savory combo gotten quite so hot and bothered as in our apple pie grilled cheese sandwich that fits in your hand (they're not full-size pies, you beautiful dreamer). Cut butter into 3/4-inch cubes. Wrap in plastic wrap and freeze for 30 minutes. Combine flour, salt, and baking powder in a food processor and pulse for a few seconds to mix well. Add cream cheese and process until mixture looks like coarse meal, about 20 seconds. Add frozen butter and pulse until you get pea-sized pieces. Add cream and vinegar; pulse a few more times to combine. Transfer half the dough into a gallon Ziploc bag, leaving it unsealed. With the heel of your hand on the outside of the bag, knead the dough until it comes together in a ball. Flatten dough into a disk, remove from the bag, and wrap it in plastic wrap. Repeat with the remaining dough. Refrigerate both disks for 45 minutes. Meanwhile, make the filling. Combine all ingredients in a medium saucepan and stir over medium heat until the apples are softened but not mushy, 3 to 5 minutes. Remove from heat and set aside to cool. Preheat oven to 375°F. Remove 1 disk of dough from the refrigerator. Lightly dust your work surface with flour. Flour a rolling pin and roll the dough until it's 1/8-inch thick. With a 4-inch-diameter round cookie cutter, cut 8 circles from the dough (you’ll need to gather and re-roll scraps). Repeat with the other disk of dough. Spread filling (5-6 apple slices) on top of 8 circles, leaving a 1/4 inch of the edge bare. Cover the filling with the rest of the circles. Use the tines of a fork to crimp and seal the edges together. Slit a small X in the top of each pie and transfer to a parchment-lined baking sheet. Brush tops of each pie with remaining heavy cream. Bake until golden brown, 25 to 30 minutes. Also place an empty baking sheet in the oven on a separate rack. 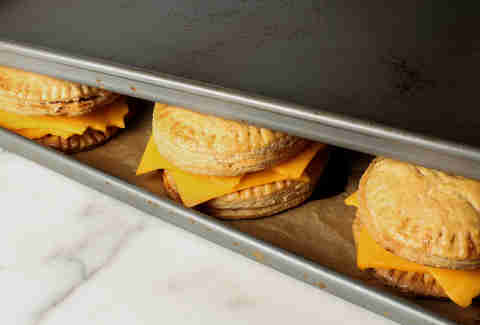 Remove pies from oven and place 2 slices of cheese on 4 of them. Top with remaining 4 pies. Distribute the pie sandwiches evenly on the baking sheet and place the empty hot baking sheet on top, gently pressing down until the top pies are slightly flattened. Let sit for 2 to 3 minutes as the cheese melts. Remove the empty baking sheet and cut each sandwich in half before serving.